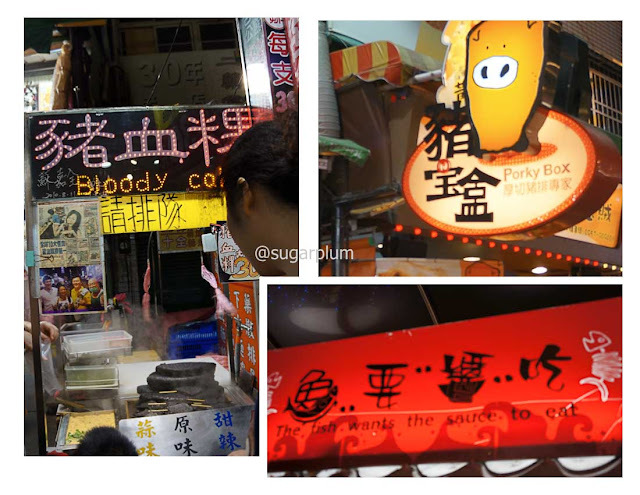 On our last trip to Taichung, Big Dog and I found ourselves hurtling towards Feng Jia night market in a taxi. Now, Taiwan taxis are a world of difference from their KL counterparts. Having experienced KL taxi drivers who are grumpy, have no clue how to get to point B, refuse to use the meter, or refuse point blank to take you to point B and are generally more a menace than a service, Taiwan taxis are a breath of fresh air. There's always a taxi when you need one. As a plus point, they even have practical taxis to boot, the Toyota Wish - it can actually fit more than 1 suitcase into the boot. Ever tried that with the KLIA taxis? I always end up paying for premium taxis just to fit our luggage. My only gripe with Taiwan taxis is the way they drive - the muddle of cars, scooters and pedestrians always just seem to miraculously avoid collision; there's probably an invisible force-field protecting them. 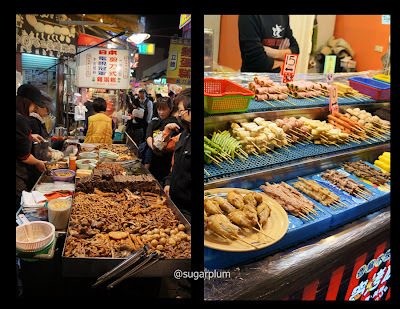 Feng Jia market in Taichung is the 2nd largest night market in Taiwan, after Shilin market in Taipei. As it is situated next to Feng Jia university, expect plenty of students and affordable trendy fashion. But we were there not to shop, but to explore street food dining options. I'd recommend that you hit the market early, at about 6pm as it gets claustrophobically crowded as the night wears on. Humans, scooters and the occasional dog on a leash. Taiwanese love their dogs, mostly the cutesy lapdog variety. They dress them and parade them everywhere. The first long queue at a stall - this is the "big sausage wrapped around small sausage" aka double layer roll aka sausage wrapped in glutinous rice. ﻿﻿﻿﻿﻿Plain tau foo far and tau foo far with the ubiquitous tapioca balls. 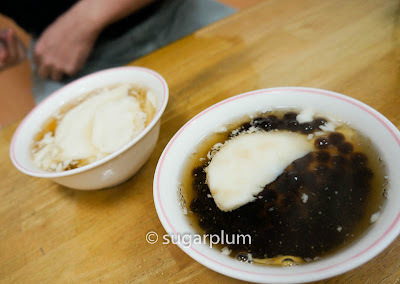 The tau foo far texture is different in the sense that it is more jelly-like rather than curdy. It's also served steaming hot, which makes the tapioca balls rather gummy. Smooth, springy and gummy textures - weird in an interesting way. 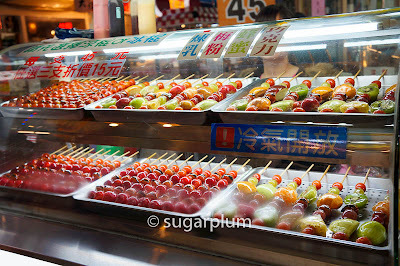 ﻿ Honey glazed fruits arranged very prettily. Are tomatoes fruit? Very temptalicious but resist I must. 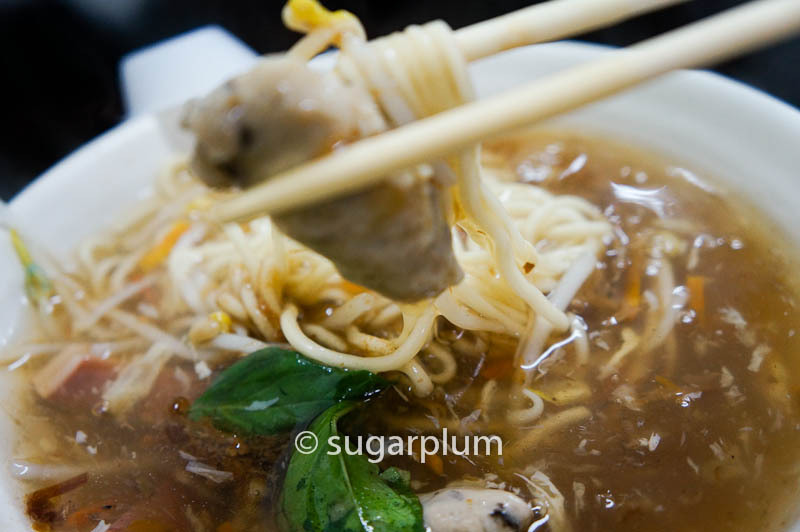 Another local favourite, similar to our lok-lok. The Taiwanese version of fast food. 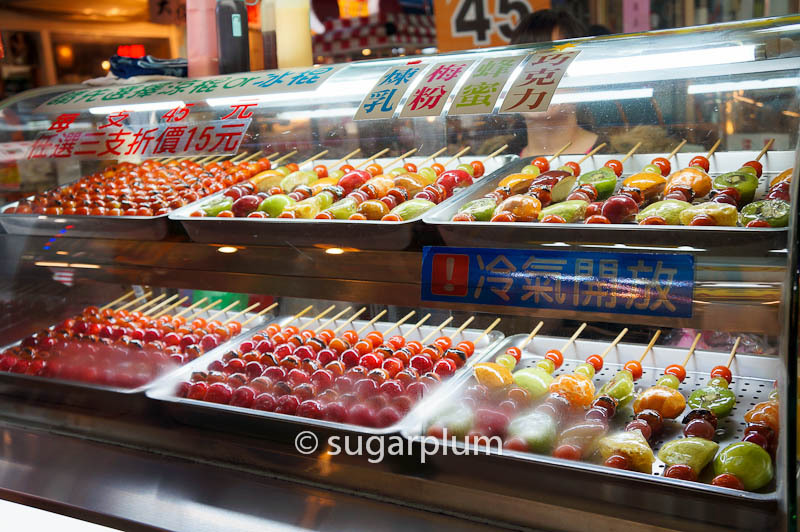 Meat, vegetables and processed food on skewers waiting to be dip and cooked in large vats of boiling water (photo on right). 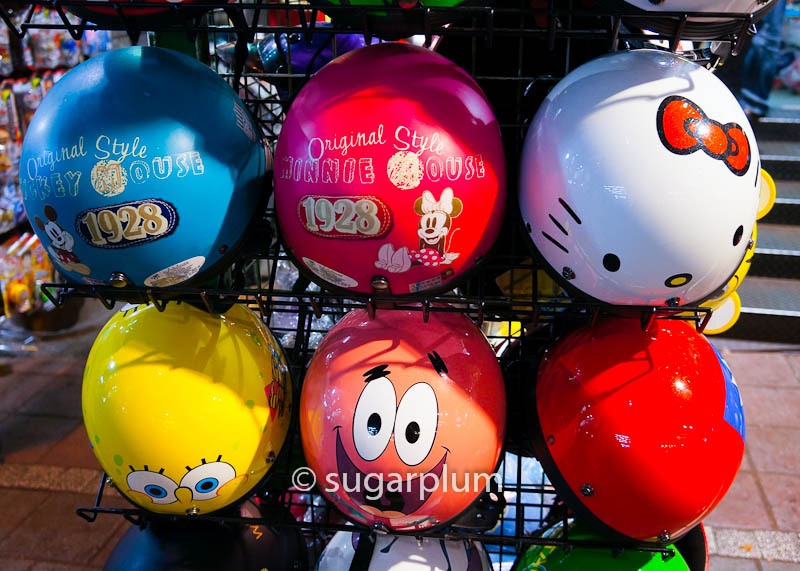 You'll see variations of this even at c-stores (convenience stores). They also love offal. You can see the selection of offal available for cooking up -stomach, intestines, kidneys liver etc all waiting to be selected by hungry customers. 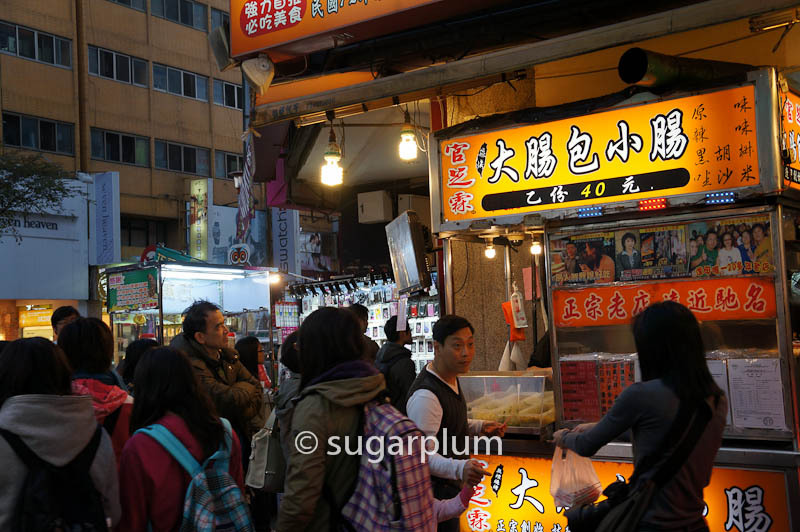 There are plenty of stalls selling soup noodles. The soup is more like a 'kang' ie thick and starchy, not the usual clear broth. Rather like mee suah kang. It's served piping hot and is just the right tummy filler on a winter night. One of our main handicaps is our inability to read fluently in Chinese. We recognise words, but sometimes menus still confound us. So we make do with recognising key words, and pointing to what looks interesting at neighbouring tables. It was hit & miss initially, but as you can see, we've gotten better with every trip we make. This was at a dimsum stall. 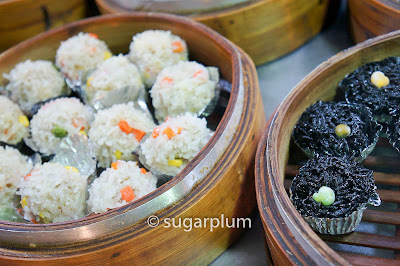 Rice balls and black glutinous rice balls, steamed up in little mini muffin cups. It's rather like eating flavoured sushi rice. A couple of literal translations into English - would you care for some bloody cake, a porky box or even a fish that wants sauce to eat? Upon closer inspection, bloody cake isn't as gory as it sounds. It's just black pudding ie congealed pork blood. Still looks pretty blood-curdling though. Porky box = a pork fillet bento. However I really couldn't decipher "fish eat sauce". I couldn't help but stop at the neon sign shouting 'squid' in such bright lurid colours. The grilled squid was irresistible; tender, juicy, liberally brushed with a sweet teriyaki sauce which caramelised over the grill and sprinkled generously with toasted sesame seeds. The prawns were largish and sweet, and in Australia you'd call them yabbies. Finger-licking good. Malaysia Boleh! Our export toTaichung - Satay! 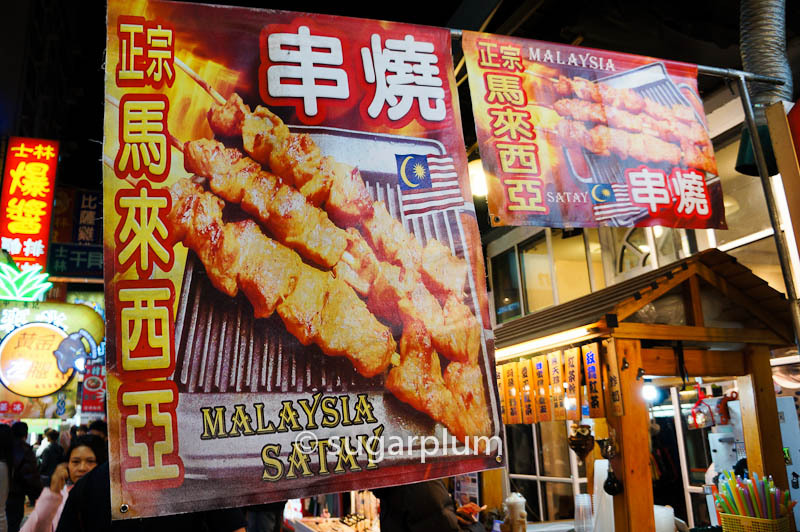 Would have missed this or thought it was yakitori if not for the Malaysian flag which caught my eye. Great post on Feng Jia Night Market! 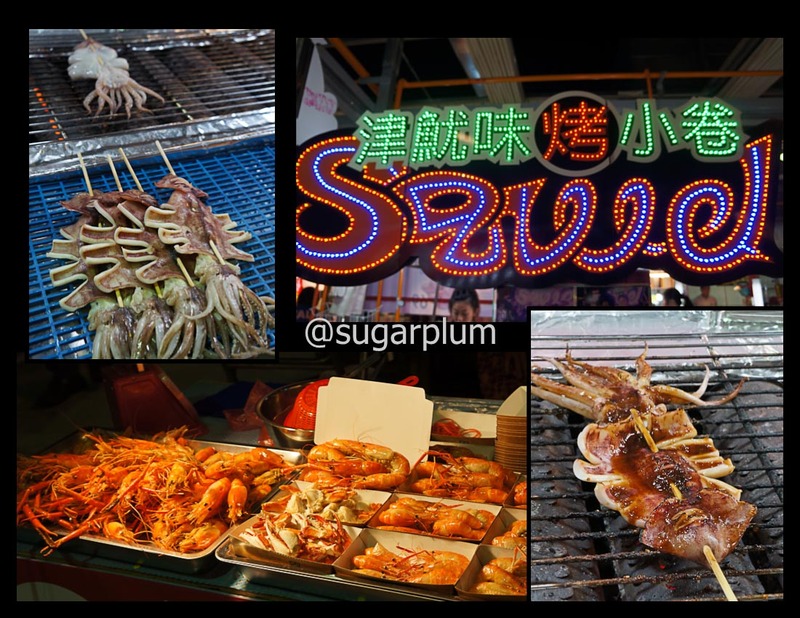 Do check out our post on what to eat at Feng Jia Night Market as well!